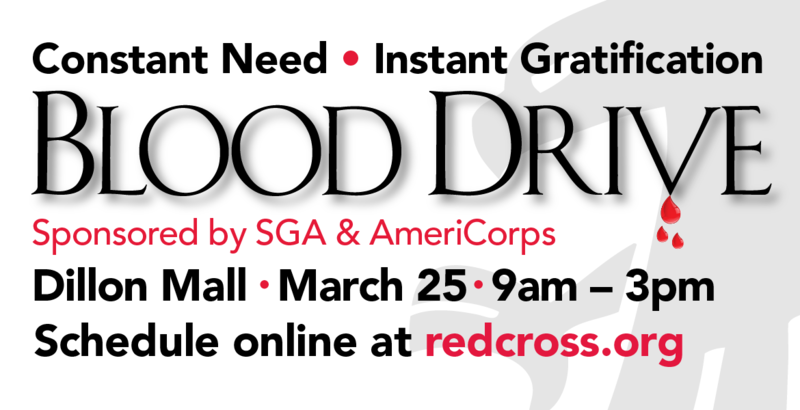 SVCC will host the American Red Cross blood drive on Monday, March 25 from 9:00 a.m. to 3:00 p.m. in Sauk's Dillon Mall. Donate and receive a free t-shirt while supplies last. Walk-ins are welcome but spots fill up fast, so appointments are recommended when possible. Registration tables will be set up at SVCC, in the West Mall and by the cafeteria, on March 4-5 and March 18-19 from 11:30 a.m. to 1:15 p.m.
You can save up to 15 minutes when you donate by using RapidPass. Visit redcrossblood.org/RapidPass for more information. To make your appointment by phone please call 815-835-6432. Donors should plan to bring their photo ID, eat a healthy meal, and drink plenty of water prior to donating blood. This event is sponsored by the SVCC Student Government Association and ABC AmeriCorps of Sauk Valley Community College.